February is National Children's Dental Health Month, and the team at Bel Air Orthodontics want to remind everyone about the importance of good oral hygiene and the role it plays in the health of your teeth and the success of your orthodontic treatment. Brushing for two minutes, two times a day is the golden rule when it comes to taking care of your teeth; but did you know that brushing alone isn't enough to keep your mouth clean and disease free? The gum tissue between your teeth where your toothbrush can't reach is prone to infection. That's why flossing regularly is just as essential to your overall health care as brushing. 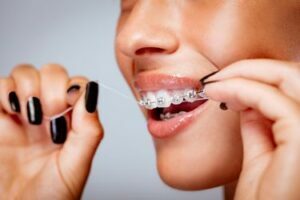 The American Dental Association (ADA) suggests flossing at least once a day to promote total oral health. Pass the floss threader under or over the archwire. Repeat the process between each tooth. 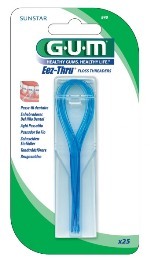 Made with a bendable but rigid segment at its end, this special floss works much the same as a floss threader. 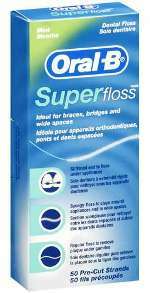 Products such as Oral-B's Super Floss have three unique components—a stiffened-end dental floss threader, spongy floss and regular floss. Simply maneuver the stiff end under the archwire of your braces, pull it through and floss as usual. All three flossing tools work together to give you maximum benefits. An oral irrigator, such as a Waterpik®, works by shooting a very fine jet of water between and around teeth to clear away plaque and food. This system can make cleaning around your braces much easier and more thorough. Dr. Godwin and the team at Bel Air Orthodontics highly recommend the use of an oral irrigator throughout your orthodontic treatment. Regardless of the type flossing tool you use, make sure that you floss on a regular basis - at least once a day. Though flossing may add one more step to your daily routine, it's just as important to achieving a healthy smile as brushing. As always, let us know if you have any questions about the best way to keep your teeth clean and healthy while you're in treatment.